Railway Preservation News • View topic - New Steam - what would you build? New Steam - what would you build? Post subject: Re: New Steam - what would you build? Since I never got to see them run, I would also vote for the NYC 6000's 4-8-4's. Roller bearings and the most modern applicances were used on these locomotives. Their careers were way too short. All I have from them is the builder's plate from 6023. These locomotves came out of the plant with aluminium Alco plates. I never believed it until I had the chance to own two of them. Great lines on these engines and I wish one was still with us today!!!! > until I had the chance to own two of them. > was still with us today!!!! Post subject: Re: new steam What would it COST? Let's say that a new, modern (in 2004 terms) 2-6-2 or 2-8-2 standardized design was finalized and various organizations went together for a joint purchase. Who could or would the builder candidates be and what would the ballpark cost for each loco be? If 10 examples isn't enough for an affordable price, how many would be needed? And, what parts, if any, would be the most difficult to find? How about an N&W Y6C.....all roller bearing. And, forget passengers, let's go see how long of a frieght we could pull through the mountains of Blue Ridge! > through the mountains of Blue Ridge! I'd have to vote for the Lima designed(1948-49) but never built Super Power 4-8-6 with the many advances developed since then by Dante Porta, David Wardale and others(GPCS,Poppet Valves,Modern Exhaust etc. etc.). My guess is we'd have a very efficient(10%), reliable-high speed(80-90mph) runner that would be a pleasure to own/operate. All we need is for someone to be willing/able to put up the measly $25-30 million so we can get on with it!! If Jerry Jacobson or Philip Anschultz are listening-how about it??? Put me in coach-I can score you a touchdown!!! 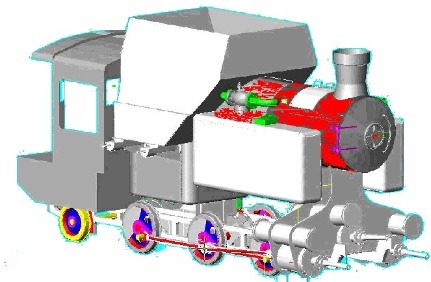 It occurred to me that there is a modern steam design for which the complete fabrication plans exist that would be very suitable for tourist service in the U.S. One of the last projects Porta had been working on before his death last year was for a new steam locomotive for switching service in Cuba (see computer rendering below). The engine was to be a standard gauge, 3-cylinder compound 0-6-2T, set up to efficiently burn baggasse (the left over husks after sugar cane is crushed to extract the juice). It was to incorporate all the design improvements Porta had devised in ~40+ years of steam locomotive work. Porta worked a couple of years with two Cuban assistants in Buenos Aires on the construction plans, which were 100% complete as of a couple of years ago. Construction of the prototype engine was to take place in either Cuba or Spain. Unfortunately, the chief proponent of the project in Cuba died, then the Cuban steam industry took a dive, and finally Ing. Porta passed away, so no prototype has been built. So, here's a complete, modern, small steam locomotive, designed to be constructed with minimal facilities and to be operated in harsh conditions with minimal maintenance. It would be a very simple matter to alter the design to burn coal or oil. I am sure some of Porta's associates have access to these plans. Anyone interested? > exact replica of something long scrapped. > class that was lost to the torch previously? > 1.) Money is no object. > 2.) You may run the locomotive anywhere. > have to say my vote would be for a Niagra. > effectiveness of the diesel nonetheless. That's a great question. DLM in Switzerland has prepared serious new steam proposals for several railways (including Mt. Washington in the U.S.). The 2-8-2T design below is proposed for use on the narrow gauge lines in former East Germany to replace ~1950's design 2-10-2T's still in service. It probably wouldn't take a lot to alter this design for U.S. service. I'm sure DLM could provide a price quote for U.S. version of this engine and produce them in quantity. Of course, importing engines from Europe would probably add to the cost, plus there'd be boiler certification issues. Still, I'll bet DLM could work with U.S. firms to come up with a viable production plan. If you're really interested, you can contact DLM through their webpage at the link below. > would the ballpark cost for each loco be? > affordable price, how many would be needed? More info on Porta's LVM800 for those of you who are interested, from Martyn Bane's website (see the link below). > website (see the link below). This leaves things way too open-ended. My decision would depend on what the loco was to be used for. Am I equipping a modern railroad with "new steam" or am I building a single loco for excursion service? Is it going to be a shortline engine or a main-line steamer? If I was going to reinstate steam in revenue service on a main-line railroad, I'd probably ask Mr. Rowland to update the ACE concept. I'd want a hybrid beast that had traction motors on the "idler" axles (probably powered by a steam turbine) for slow-speed lugging, plus conventional reciprocating rod drive for high-speed power. I'd want a computer-controlled, high-efficiency boiler to allow one-man operation. And I'd want the thing to be easily convertible between different fuels, from coal to oil to just about anything else. We're pretty open-ended on a main-line excursion program, too. I'd want something with plenty of power, preferably a passenger engine with a four-wheel lead truck. So we're talking a heavy Pacific or larger. Based purely on looks I'd pick the PRR T-1, but by all acounts it was a bear to keep from slipping. Maybe a NYC J3a? I'd hate to replicate something that still exists. At the smallest, I'd pick a Hiawatha engine. For a smaller operation, I'd most likely choose to replicate a nice little 4-4-0 or 2-6-2. Again, the decision what to build would be based on where it'd run. For "my" curvy, hilly railroad, I'd want a nice little 2-6-2 with small drivers and plenty of steam. For a railroad like Strasburg that's relatively flat and straight, I'd probably choose a beefy 4-4-0 like a PRR D16sb. If I was rebuilding the EBT as a working narrow-gauge line, I'd most likely build a half-dozen or so new 3' gauge Garrets, probably with a 2-6-2+2-6-2 wheel arrangement. No matter what I built, the boiler would be a modern, high-efficiency boiler made to look as close as possible to the "right" boiler. No sense in irritating the environmentalists! Even if you had a pot of money I think that the frame would be a major problem. If you want to do a casting like they did it in the "old days" not sure that there is anyone in the USA who can still do something as big as a medieum steam loco. A welded boiler, wheels, rods, appliances can be had or made. But that frame. As i understand it the A-1 Trust used a welded frame in their new Tornado loco. As they did in the original class. The A-1 uses "plate" frames which were standard practice in the UK and much of Europe. I don't believe any welding is employed; the frames consist of relatively thin "plates" joined by bolted castings in between. They refer to conventional U.S. style steam locomotive frames which are fabricated from much thicker material as "bar" frames. ACE proposed the use of an all-welded frame, which could be equal if not superior to a one-piece cast bed frame. If I was going to try to build a replica modern U.S. steamer, that's what I 'd use. > as big as a medieum steam loco. > in the original class. I have been told, that the Strasburg Rail Road has the original builder's plans from their 1924 Baldwin Decapod #90, and that they would be willing to build an exact replica for 2 million or so! In as much as I've never seen any PRR steamer under steam, most anything PRR would be great. I recently read an article that said the PRR 4-4-6-4 (or was it the 4-6-4-4?) might have been able to challange diesels but came too late to work out the bugs. Giesel and poppett valves. Open ended as the rules are, I'd choose either an ACE loco to see how well it could do against diesels or a 3' gauge 2-6-2+2-6-2 Garrett (as D&RGW might have ordered). Maybe the RGS or ET&WNC proposed articulateds. Actually, I'd like a D&RGW 3' gauge T-12 10-wheeler. The one non-diesel I'd like to see is a GG1 with new electronics. Maybe geared for 250 MPH? Modern steam would help...then we won't have to worry about the middle east controlling more than 50 percent of our economy due to oil if the locomotives were coal fired (or terrorist cadaver fired...hey it saves the taxpayers who are paying to keep them imprisoned...) That was a joke of course. The US supposedly has a 400 year supply of coal or something. It's cheaper than electrifying every mile of rail in the US today and ruining the aesthetics by having catenary in the middle of the plains. I hear that the JPB on the SF Peninsula is thinking of electrifying with catenary, which I find sort of rediculous, especially to Gilroy. Take New York City and Los Angeles, the two most populated metropolis(s) in the country. LA doesn't have any electrified likes with Metrolink, and the electrified commuter lines in New York only go 30 and 50 or so miles. I think their best bet to go into the transbay terminal is to get themselves some trusty General Electric genesis dual modes and lay some third rail in their tunnel into the new terminal when they're ready. Run the things on diesel power and switch on over to electric when they hit the tunnel so they don't gas themselves. Enough of that rant. As for replica steam...tough one. I'd have to say an SP 4-8-2 in the skirting as used on the Peninsula line circa 1958 when steam quit on the line would be nice. A New York Central Hudson would be great running on excursions on the Hudson Division but I'm not big into east coast steam, and Metro North would not allow it most likely. I think there are several locomotives that I would like to see run again. Number one on that list is the SP 4294 cab forward at the CSRM right now. Plus I think that the old 4-6-0 (forget its #) that the SP used on publicity moves on the SF Peninsula that was backdated would be a perfect engine to haul the Sacramento Southern trains instead of the little 0-6-0T. It was at the Texas State RR, now its the "Tarantula Train" and is wearing an unusual cap stack. In addition there's a GS-6 at the St. Louis Museum of Transport and two NYC Mohawks (one there, one in Indiana) that would make fine excursion engines. As mentioned before, it seems that the next big engine to be returned to service is LIRR #39, but work hasn't even started. We've lost 614 and 1522, the steam world needs to give another locomotive a second chance.